ne of the largest and longest established 10km running events in the North West of England. 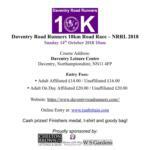 Hosted by Bolton United Harriers & Athletic Club, it attracts a good mix of Club-class competitors whilst also being suitable for social runners, beginners and charity fundraisers. Enjoy a trail run through the grounds of the National Trust’s Wimpole Estate. The route takes in parkland, lakes, a folly and spectacular views of the Cambridgeshire countryside. 14 hours of non stop racing, starting at 22:00 on Saturday and finishing at 12:00 noon on Sunday. Race through the night and enjoy a brunch with your fellow competitors at around 12 noon the following day. Warwick Half Marathon is a rural, challenging event. This UKA affiliated event sees runners of all experiences taking part, the undulating countryside course is a real test of your endurance and determination, whilst giving you the opportunity to raise funds for the British Heart Foundation. 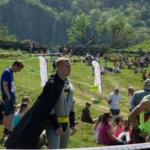 Trail Adventure Event – £22, £27 OTD – Trail Run only, using a 1:25k waterproof map, plan your route and navigate to as many checkpoints as possible in 2 hours. Enter more than 2 weeks before and pay £17. Minimum age to take part is 8 accompanied or 16 unaccompanied. Off-Road Duathlons, MTB only, and 10km Trail Runs, raising funds for Friends of the Hurtwood. Trail Run (£22.00; £27.00 on the day) 10k – This signed woodland run will follow the same route as the first part of the Duathlon. UNESCO’s newest World Heritage Site marathon. A 26.2 mile circuit of Windermere taking in Hawkshead, Newby Bridge and Bowness-on-Windermere along the way. Voted the ‘most scenic’ by readers of ‘Runner’s World’. Finish the breathtakingly beautiful and challenging course amidst a carnival atmosphere, in the grounds of Brathay Hall.